Imagine a video game that has suddenly come to life. Austin Cluetivity is a game that combines state-of-the-art augmented reality technology with a mapped scavenger hunt that consists of trivia like questions, riddles, puzzles, mysteries, and more. Clues to solve the mysteries will be found in both real and animated worlds. Each unique route will consist of popular downtown destinations including the Driskill Hotel. 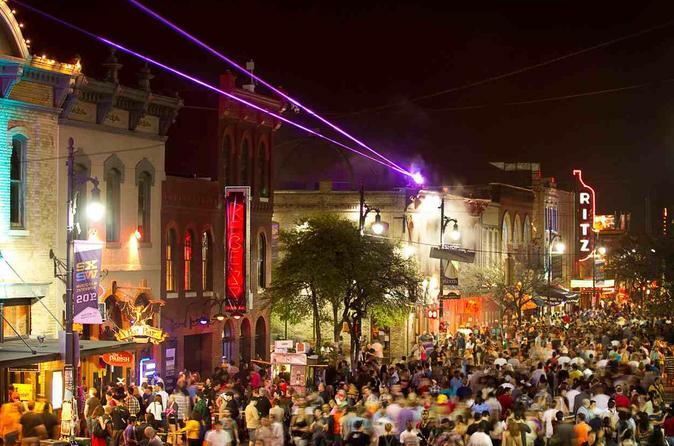 During this evening bar hop, you will game yourself through Austin’s entertainment districts popular bars by using an iPad with a pre-loaded game. The map in the game will show you where to go on this 120 minute experience. Participants must be at least 21 years of age.This game contains puzzles and question/answer boxes and a bit of Augmented Reality that will require you to locate physical clues on EAST 6TH Street inside and outside bars. Expect FUN challenges on your journey to interesting and popular bars. Imagine a video game that has suddenly come to life. Austin Cluetivity is a game that combines state of the art augmented reality technology with a mapped scavenger hunt that consists of trivia like questions, riddles, puzzles, mysteries, and more. Clues to solve the mysteries will be found in both real and animated worlds. Each team will receive an iPad with the game pre-loaded, and an 'action-pack' with tools needed to solve the mysteries. A magical map will appear on the iPad to navigate you towards dropped pins (or crystals) using built-in GPS technology. The location of your team will be shown on the map to aid you in reaching each destination. Once your team is in close proximity to the crystals (or pins) a question or task will appear on the screen. You will need to use the provided 'action-pack' tools to solve the mysteries and earn points. Your group will be guided by a 3D goblin who can give hints and help you along your journey. Each unique mapped route will consist of popular downtown destinations, scenic areas, shopping districts, historical locations, coffee shops, and more. Bars you will visit during this activity include Coyote Ugly, Russian House, and more. In these areas, you will find hints and clues to help you solve the mysteries and earn points. The team with the most points when the timer runs out, wins!